Last night I met some friends for happy hour at Matchbox in the relatively new Mosaic District in the Fairfax/Falls Church/Merrifield area. The original plan was to watch The Great Gatsby afterwards but this didn’t exactly pan out. I haven’t been able to pinpoint its exact location, but it’s close to the Dunn Loring Metro Station and my GPS recognized the address when I typed in Falls Church. I’m often a little suspicious of suburban town center developments because, in my humble opinion, they feel artificial and overly “new” rather than organic and charming (as I like to imagine town centers should be). Although this one definitely feels very new and shiny, I actually quite liked it because it feels original. Architecturally, it’s quite different from Fairfax Corner or Reston Town Center: Think lots of glass, metal and sharp edges. Strawberry Park, the small green space at the center of the development, is used for events such as outdoor movies and yoga. 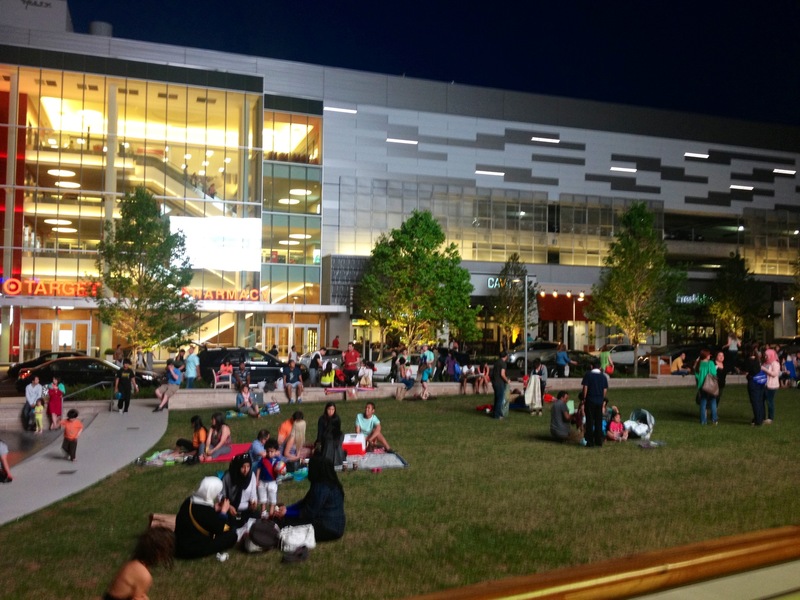 When I was here last night, there were a lot of families enjoying an outdoor movie, kids having fun and people showing off their dogs. There are bars, restaurants, coffee places and shops around Strawberry Park, as well as a very modern Target Store and the Angelika Movie Theater, a chic, fancy-looking theater playing mostly independent and specialty films. The Mosaic District is still pretty new and although there seem to be residential developments in the works, it still feels a little removed from a significant residential community. One bonus? Parking is relatively easy to find and free, a perk of suburban living. I’d like to go back in the near future to check out the movie theater. This picture’s a little blurry but you can see people enjoying an outdoor movie in Strawberry Park. 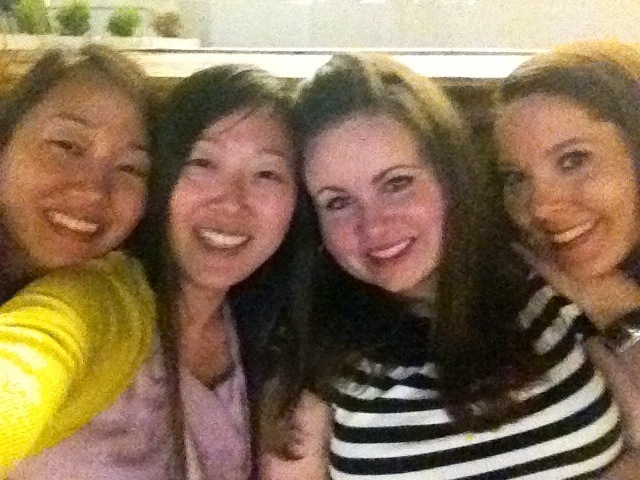 Hanging out on a giant bench in Strawberry Park after getting drinks and dinner at Matchbox. To read my second Mosaic District post click here. I went to the Angelika three times when I was home for Christmas, and it is sooooooo great! They have deals for students on Tuesdays, I think. They also gave me a free totebag. Let’s go when I am back!